Most college students and young twenty-somethings have at least one social media account. Whether it be Facebook, Twitter, Instagram or Snapchat, you can surely find someone utilizin g these platforms to showcase themselves with their followers. It can be snippets, snapshots, stories or even trials and tribulations that one deals with daily. With today’s generation, some users can even gain recognition and fame from their posts by the way they brand and market themselves to the cyber world. Erika Lipps, a Kent State alumna who studied communication studies, has recently found herself as an A-list Instagram user. 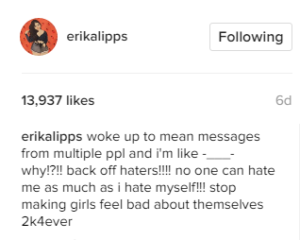 Lipps, (Instagram username @ErikaLipps), has over 121 thousand Instagram followers and continues to gain hundreds and thousands of followers daily. Before her come up on social media, Lipps has always been interested in the idea of online branding and how social media can give someone the opportunity to reach large scale audiences. During a speech she gave at Kent State in a high impact speaking class, Lipps shared that she was discovered online through her fashion posts once by Teen Vogue. They posted her style on its website, and that made Lipps want to continue to brand herself more on the web. 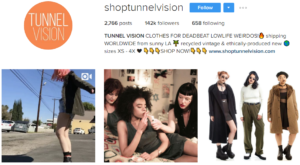 Lipps was lucky enough to be awarded an internship with clothing company Tunnel Vision in Los Angeles this past summer, where she modeled its clothing. The exposure she received from its Instagram account helped her gain followers instantly. Even though her following is larger than ever before, she always had visions of herself fulfilling these dreams and aspirations. “I have always been passionate about storytelling and visual journalism, so starting an Instagram dedicated to my personal narrative and fashion blogging went hand in hand together,” Lipps said. Whether you want to call her a model, advocate or public figure, Miss Lipps is breaking the mold of what your average Instagram fame individual fits. Her account has caught the eye of thousands of users, and it continues to grow. Her posts are artistic and beautiful, yet sincere and candid. She shares everything from what makeup brands she uses and clothing she is rocking to the issues she faces within herself, beliefs and struggles. Admitting to dealing with confidence issues and self-love herself, she advocates to her followers the misconception that Instagram has forecasted over her: confidence. Rising to stardom online can come with rewards like recognition, fame, fans and even business opportunities. 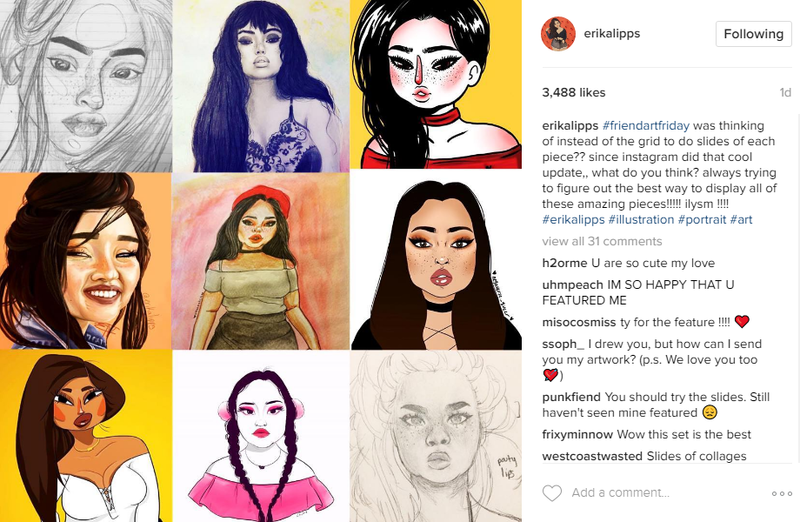 Lipps’ Instagram feed is flooded with many #friendartfriday posts, where hundreds of other artists recreate Lipps in their version and she posts them on her page. She has also had significant business ventures with other fashion brands wanting to work and collaborate with her, like Fashion Nova and Deb Shops. She recently just announced that she will also be collaborating with the Missguided plus size range as well. With all this fame and recognition, there also comes a dark-side: the haters. Lipps admits that this is the hardest part of gaining a following online. Lipps also mentioned how emotional, blessed and privileged she feels to be working and modeling with companies while being 5’0 and plus size. Lipps continues to break the stereotypes and shake the haters off by focusing her energy on people who support and love her. Her future is bright, and she won’t let any mischief’s stop her from conquering her goals. Show the gorgeous fashionista some love on her instagram, @erikalipps. Also, be on the lookout for deals and discounts she shares for beauty and clothing companies.